Trouble is erupting across Metroville, but The Incredibles can save the day! Work together to stop the crimes before its too late! As the alarm goes out across the city, tiles are flipped over in the game board, revealing new problems and even changing the game board paths. Each player has a unique power, so strategize who will take on each challenge. 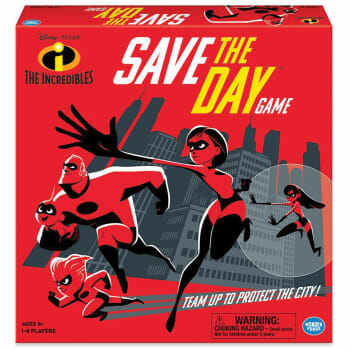 If you can defeat the villains and save the citizens before time runs out, you'll be the heroes of the city!